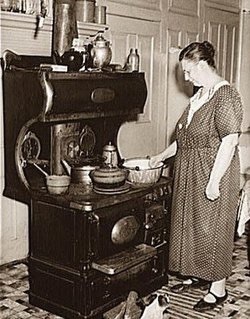 Grandma at her cook stove. Don’t have a photo of her but this one conveys my memories, right down to the dress and hair bun. This lady is missing the full-length apron and what I called Red Cross Shoes–lace-up oxfords with about a 1.5″ heel. For more cook stove photos, click here. That old farm house was cold and drafty. Built in early 1900’s on a farm near Popple Creek, MN, by my maternal Grandparents, Paul and Augusta Walk, it was heated with a coal heater in the dining room, which was the central room of the house. The ‘Front Room’ was closed off to conserve heat and the chimney going up through the second floor, was the only heat for the three bedrooms. Sidebar on Popple Creek: Popple Creek is a wide spot in the road half way between Foley and Sauk Rapids, MN. At one time there was a saloon/bar where my Uncles Herman and Oscar Walk would stop by for a cold beer. I was never allowed in but am sure my brother was. Grandma’s farm was 2-3 miles NE on the Golden Spike Road and Uncle Herman and Aunt Myrtle’s farm a mile or two East; the two farms adjoined. All that’s left is an empty saloon (last time I was there) and St. John’s Lutheran Church a suitable distance down the road from the saloon. But the Kitchen, now that was a warm and cozy spot. 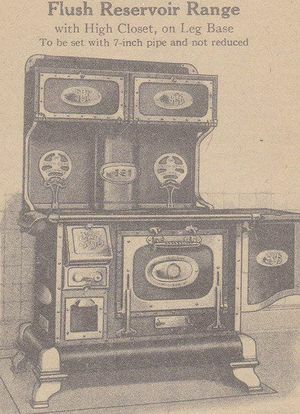 There was always a fire going in the cookstove plus the smaller room contained the heat. Breakfast and lunch were eaten in the kitchen and the dining room only used for supper and evening relaxation. I asked for and got Grandma’s stove with the intention of refinishing it as a display piece in the Family room. 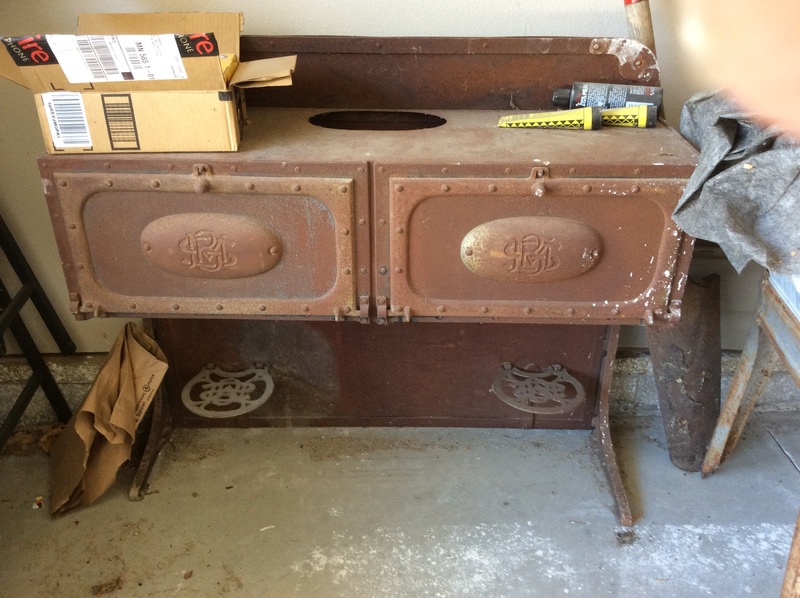 Never could find a restorer, then moved 12 years ago and the stove parts have been taking up garage space ever since. What a rusty mess! 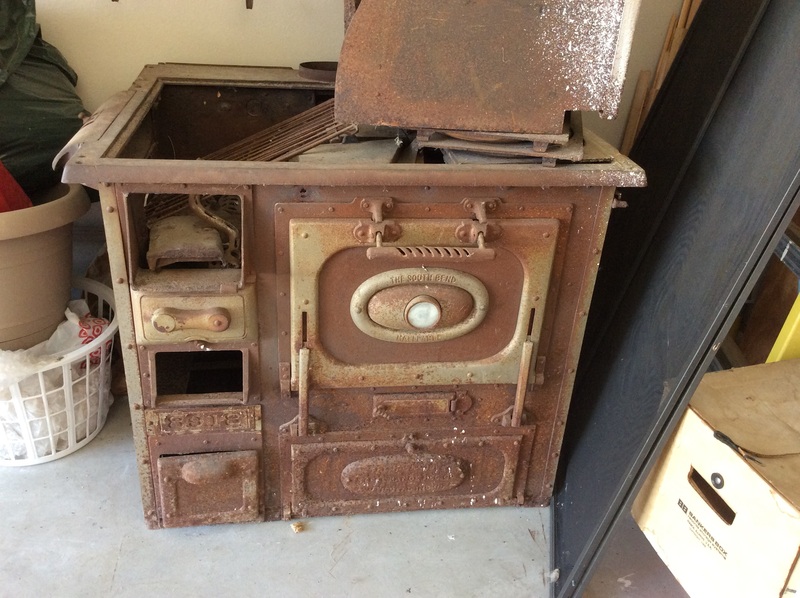 This is what Grandma’s stove would have looked; even this one is not in pristine condition. Grandma’s stove had the water reservior as in The Malleable Steel Range, but does not have the base with legs. To the right of the reservior stood the sink which included a cistern pump. A large cistern for water storage was located under the house. Rain water from the roof was directed to the cistern for storage. It was pumped up to the sink to use as grey water and to fill the reservior which provided a constant supply of hot/warm water. 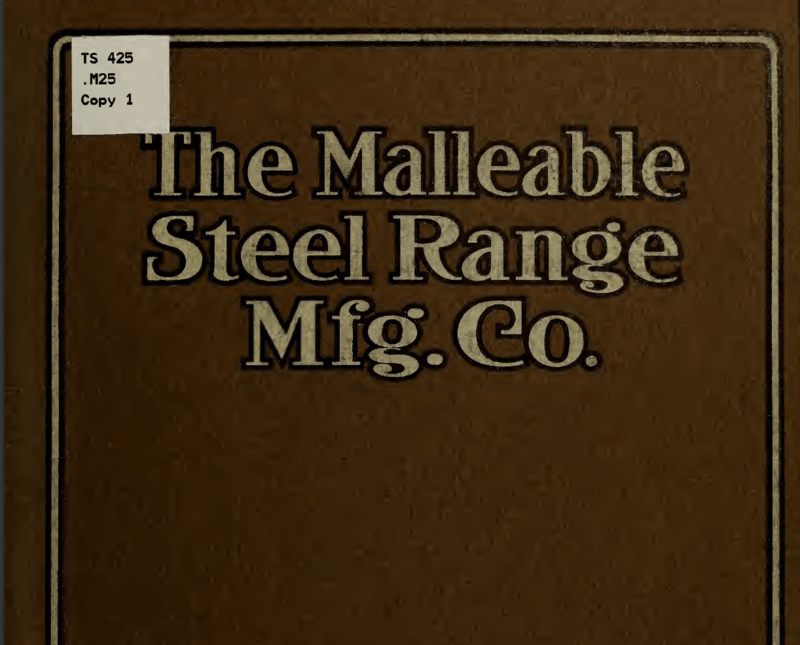 The South Bend range was manufactured by The Malleable Steel Range Mfg. Co., South Bend, IN, hence the South Bend name on the oven door. 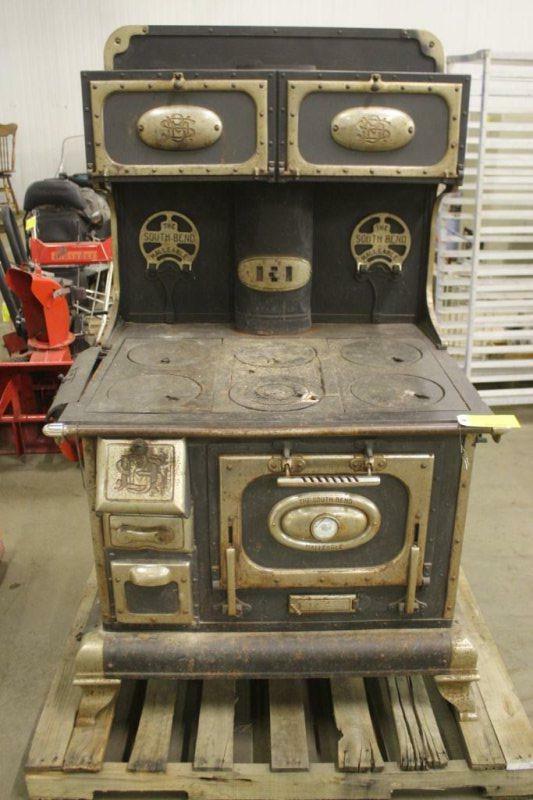 The back story of the cook stove is that it was ordered from the Montgomery Wards catalog and arrived in Sauk Rapids, MN via train. Grandpa took the team and sleigh 12 miles into the depot to pick it up. Can you imagine the excitement when that black, nickel trimmed appliance arrived. And then the menfolk had to muscle it up the steps, through the peanut sized back porch and into the kitchen. Whew! It’s never going in the current house–no space and doesn’t fit the style. But, it’s gotta go somewhere, preferably out of the garage. and better now than later. The following is a public domain book. This entry was posted in OUT AND ABOUT and tagged cistern, nickel plated, range, reservior, South Bend, The Malleable Steel Range, woodburning cook stove. Bookmark the permalink.